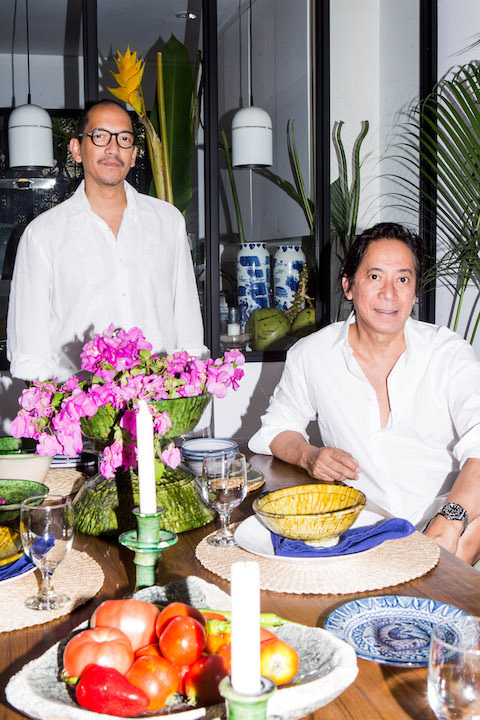 Sibling tastemakers Noel Manalili and Raul Manalili’s mission for their late parents’ retirement home in Quezon City is pretty simple: to make it more like a vacation house—and while they’re at it, put the spotlight on Filipino designs and furniture that appeal to their contemporary design sensibilities. After all, Noel now resides in Le Havre, Raul in Madrid, their two sisters on the other side of the world, and they have a 300-sq. m. space in Quezon City to themselves. The sculptural furniture by the wall is the kudkuran ng niyog Noel and Raul Manalili bought from furniture maker Ruben Maranan. The daybed is from Milo Naval. What used to be a dated, cramped, and dark space adorned with too many details finished with dark wood varnish two years ago now basks in a constant supply of light through the huge windows. 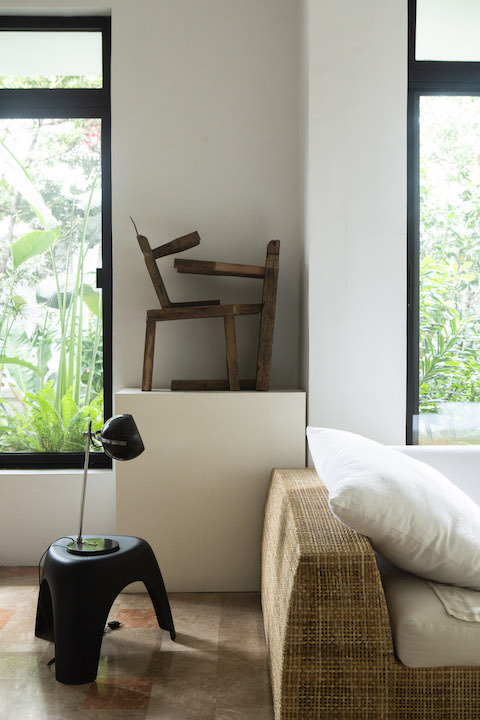 The 30-year-old abode flaunts its space made bright and vast by the white painted walls, giving room for the carefully selected furniture and curios to stand out as characters in their own right. 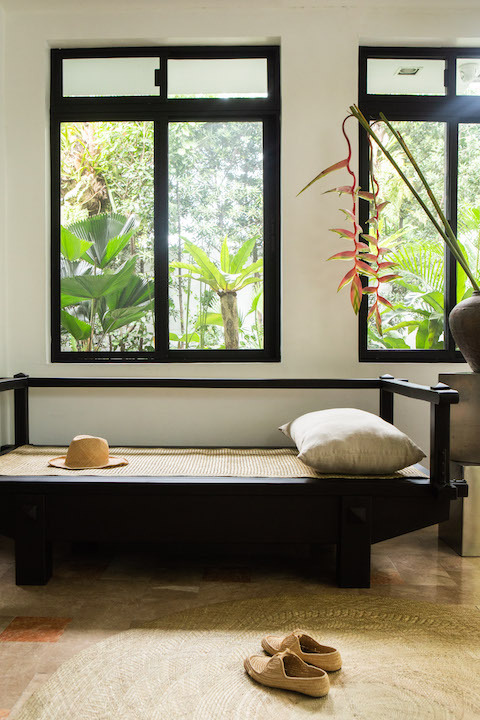 Items made with natural materials give warmth to the space—there are banig sourced from Bukidnon, wooden plantation chairs from Pampanga, and Milo Naval-designed daybeds with woven rattan as wraparound arms and back. “We always try to find ways of doing things differently,” says Raul. “Like do a different version of things that are Filipino, make them emanate a different feel, more contemporary.” One time, they met Ruben Maranan, a former cardiologist and now a furniture maker, at Sidcor Sunday Market at Eton Centris. 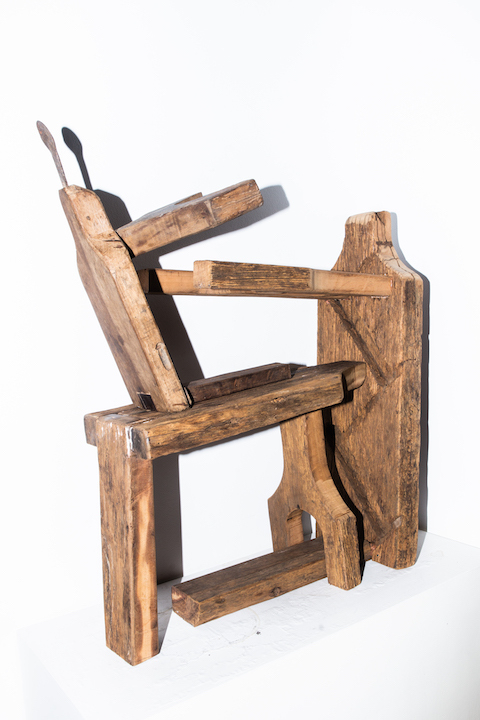 They went to his place to see more of his old wood-based pieces when a particular item in Maranan’s kitchen caught Raul’s eyes—it’s a kudkuran ng niyog or a stool with a coconut scraper attached on one end. It’s mostly used in the province, pre-electric grater. It was “such a nice sculpture,” says Raul, that they had Maranan make two more specially for their home. Now, the scrapers stand on a rectangular pedestal on one side of the house. Another item of interest is a stool Noel acquired from Bontoc, Mountain Province. A curious- looking sculpture when folded, “it’s carved from one piece of wood without any joints. It’s quite a feat,” says Noel. And his latest favorite find? A sleek, rustic, and clean Filipino papag made from acacia by Maranan. They also had it altered, got rid of some details to make it minimalistic and painted it black. Overall, the house, which they call Villa Andresa (named after their mother), is elegantly sparse, which Noel admits is a style that he’s very into right now. 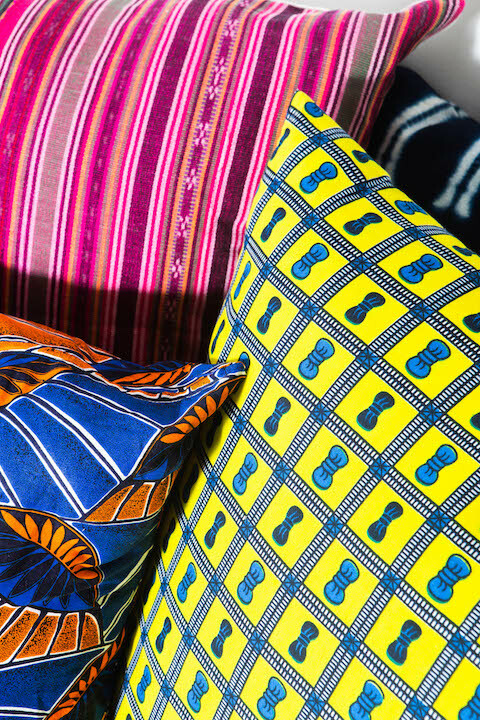 “It’s just a matter of choosing strong pieces so we won’t feel the need to add more,” he says. “We want the objects and furniture to stand out so we can appreciate the materials used more,” says Raul. “This,” referring to Villa Andresa, “will always be a work in progress,” says Raul. The two will always scour flea markets all over the world. And the two will always find ways to showcase them in a different light. Watch out: The Manalilis are launching an online shop this year featuring unique functional objects for the home, sourced inside and outside the Philippines. For the meantime, though, here are some furniture shops and markets they recommend. Mon. 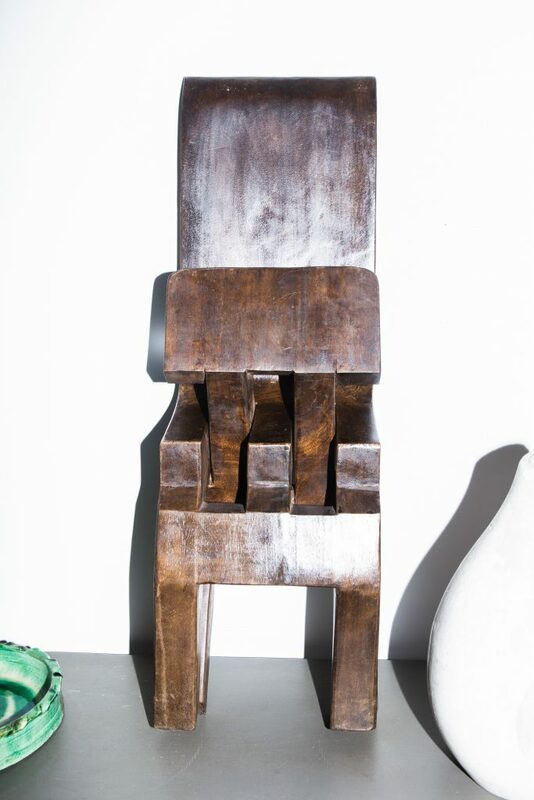 to Sat., 10 a.m. to 7 p.m.
Milo Naval is the renowned furniture maker behind Omo. Utilizing locally sourced materials, his designs emanate a warm and natural vibe in any space. 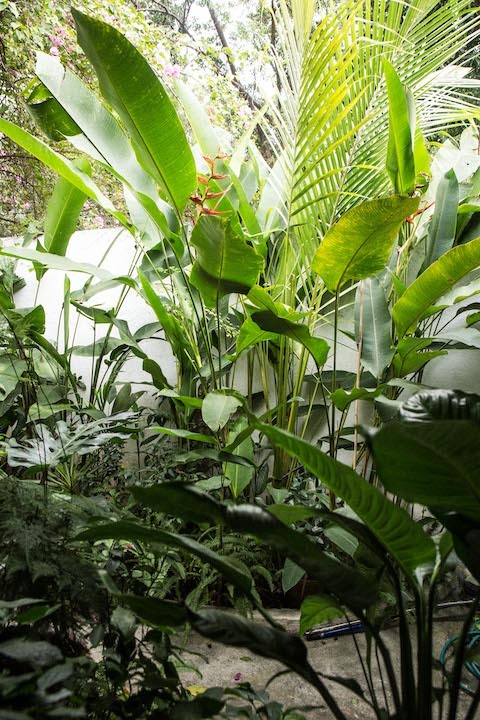 Artelano 11 or A-11 is an eclectic space curated by designer Eric Paras. Here you can find almost every kind of furniture, art, accessory, and kitchenware for your home. 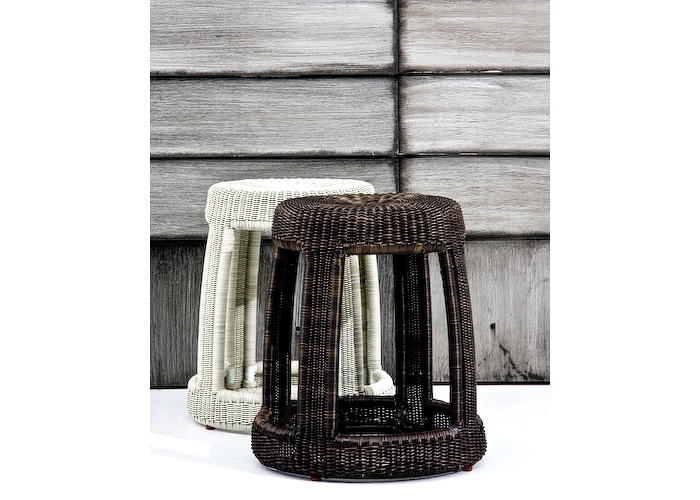 Calfurn is an Angeles City-based furniture manufacturer which makes great baskets and furniture. Every Sunday, 6 a.m. to 2 p.m. This is where the Manalilis discovered Ruben Maranan and his old wood-based furniture. You might want to track him down here, too. Every Saturday, 7 a.m. to 2 p.m. In the middle of artisanal food and local produce stalls, there are hard to find trinkets and pieces that would look good in your space. Every Sunday, 7 a.m. to 2 p.m. The brothers got their banig from Ding Perez at this weekend market. 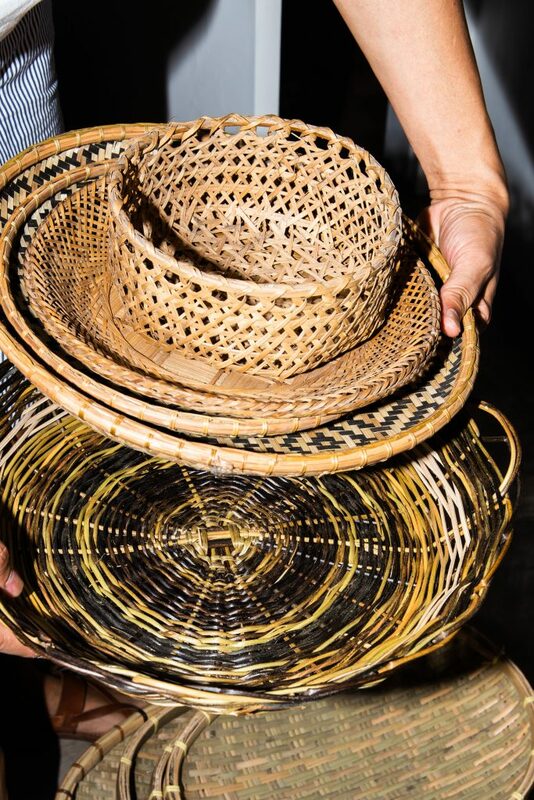 Check out his other handicrafts and houseware here.